For real this time! I said I was going to do this in January, but things were all out of sorts around here with the boys traveling to Grandma and Grandpa's house and things in general gearing up for the new year. If you're not sure what a pantry challenge is, Jessica at Good, Cheap Eats explains it well, and her blog has lots of great tips and information that just might get you motivated to try it. Basically, my plan is to plan our meals as much as possible using the foods we already have in our pantry and freezer. I haven't done a full freezer inventory, but I know that there are plenty of things in our fridge, pantry, regular freezer, and the deep freeze that need to be used up to make way for fresher items. 1. Clean Out! - I am hoping this will, indeed, help us to use up some of those items that get pushed to the back in favor of our favorites. You know what I mean. It was a good deal, and you don't want it to go to waste, but you just never seem to get around to using it. 2. Save Money! - We began working through Dave Ramsey's Financial Peace University with a bunch of people from our church and another local church in January, and you'll be hearing more about all of that in the near future. We're trying to get gazelle intense about checking off those baby steps, so anything we can save from our usual grocery budget this month will go toward doing that. 3. Mix it Up! - Most of the things we have in our stockpile are things that we like, but they often get looked-over in the midst of a buys schedule for items that can be cooked more quickly or without as much thought and effort. I am hoping to try out some new recipes and bring back some we haven't seen in a while. I am a firm believer that the key to happily preparing meals and eating at home is keeping it fun and adventurous, so I think this will definitely help our budget in the long run. I am usually overly hesitant to make commitments on my blog because I am totally afraid I will flake. I told someone the other day that I have a fear of commitment (when it comes to meal planning), and it's so true. That's why I'm laying it all out here. This is going to help me stay motivated and feel accountable. 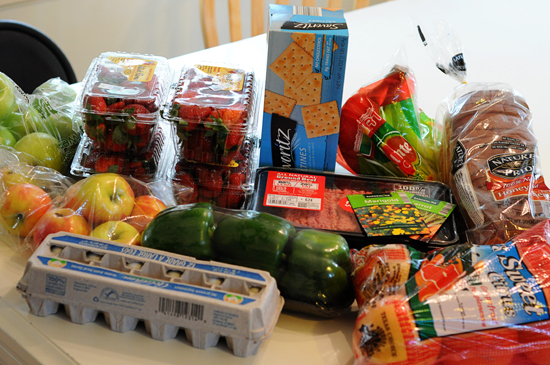 Each week, I will post a detailed account of how much money we have spent from our grocery budget along with what we bought. Here is what I bought this week. February just began on Wednesday, but this is all I bought the whole week.